Delicious chocolate balls individually wrapped in luxurious foil. Case of 60 chocolate champagne bottles - 8g each pieceThese miniature champagne chocolate bottles ar.. 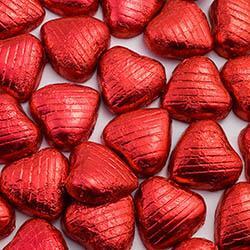 Delicious Belgian Chocolate Foiled HeartsSolid milk chocolate and individually wrapped in luxurious ..